Here at Ride Tek, we offer a broad variety of training. What sets Ride Tek apart from the rest goes beyond our trained staff and modern facilities. As well as being being based at Sandown Race Track. The track is used on the Track Days. The rest of the training is conducted on our training range and out on public roads. Our classes, lessons, tutorials, and courses are designed to educate and test riders of all experience and levels, whether raw learners or experienced. If you’re eager to learn more about motorbike riding, then take a look at the courses we offer. Many people want to learn how to ride a motorcycle correctly and safely. The Pre-Learner Course is perfect for people who need help getting from step A to step B prior to actually taking to the road. This course is actually a great place for anyone to start. Even an experienced rider who needs a refresher on the basics will greatly benefit from it. The Pre-Learner Course is actually a very short course compared to the rest. It is two hours long at most, yet covers a lot of important riding fundamentals that beginners need to know. These are all fundamental concepts that should be covered before starting the Learner Permit Course. If you already have the basics mastered, then feel free to start your learning with a more advanced course. The next logical step is to to take the Learner Permit Course, which can help you tremendously in obtaining your motorcycle learner permit. The Learner Permit Course takes all of the fundamentals you learned in the previous course and apply them on the road. You’ll learn all of the basics of motorbike operation. While it’s possible to take the test without undergoing any training at all, your chances for success are increased significantly after taking the course. Once you’ve finished the Learner Permit Course, you can proceed to taking the Learner Permit exam. If you pass the test, you will be issued a learner permit. If you’ve attended all of the lessons, then the entire exam will be painless and you’ll be prepared answer all the questions. Once you’ve held the Victorian Motorcycle Learner Permit for at least three months you can apply for a motorcycle licence. It’s recommend that you take our Licence Course prior to applying for a licence. 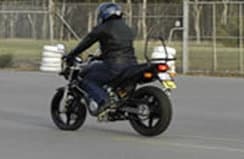 The Licence Course will be more in-depth than the Learner Permit Course as it deals with more advanced riding concepts, techniques, and skills. Our students’ rate of success is nearly 100 percent. These are the skills required to ride a motorcycle safely on the road. If you pass the test, then you’ll be issued your official Victorian Motorcycle Licence. As with any test, your chances for success are always increased when you take the time to learn, study, and prepare.